It has been pretty crazy at the Garcia home! We have finally moved into our new home in Champaign YAY! The unpacking process has been pretty crazy, but it has been getting done slowly but surely. The room that I really want done is my quilting room, but unfortunately I haven’t got there yet. I do have some of it done but it is not a space that can be worked in yet. I am hoping to get it done before valentines day! Today I finished the kitchen and yesterday we finished the play room! Christian’s room was simple and has been done for a while since all he had was his bed. His clothes are in drawers in the closet and that was done before our storage unit got here. I am sure you all know already that there was a major blizzard that came through the country. We got hit by it too, but we didn’t have anyplace to go so we just stayed home and unpacked! My sister and brother in-law ventured out into the snow with their oldest daughter izzy who is 2 1/2 and the drifts were much taller than her! Oh Illinois winters, this is one of the reasons I want to move away from this state! Well I really do have a TON to finish, both with unpacking and homework. So I am going to keep it short today, but I promise I will be back at least 3 times per week from now on! Well Its been a while since I have put up a post … sorry 😦 Things have been a little crazy around here this holiday season! I have spent lots of time with my family though so it has mostly been good time! There have been a few changes to what we thought our plans were going to be … but really isn’t that the way things always happen? Just when you think you have things under control a monkey wrench gets thrown into the gears and things go all wonky. Anyways Steven and I’s original plan was go stay with his parents till the middle of March and then find a place in the Chi-town area and go to school and work part time jobs to supplement the GI Bill. Well that has since changed. For reasons I don’t care to go into we aren’t staying with his parents and have decided to move to the central Illinois area and go to school one night per week in the burbs (since things are already set up there and its too late to change it all to down state schools). So now we have been on the hunt for a place in the fabulous town of Champaign. One thing is for sure about this town and that is it is MUCH MUCH MUCH cheaper to live than the burbs!!! We are going to get a house with twice the space as our previous apartments for less money … and not just a little less … like 2/3ds of the payment for rent!!!! 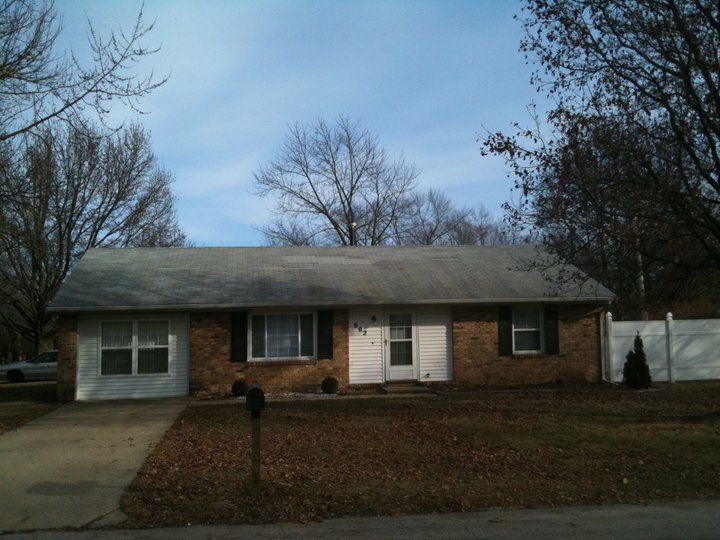 I think the house is uber cute too … the yard is really big because its on a corner lot! the privacy fence on the side of the house doesn’t go all the way around to enclose the yard right now but the land lord plans on doing that once the ground thaws and its not so cold out side … i told him i was right there with him on not wanting to dig in frozen ground! the place has 3 bedrooms which is a step up from our 2 bedroom places of the past and there is a family room and living room as well as a dining room … the family room will likely be a toy/play room for christian since the bedrooms are a little on the smaller size and then we will have our ‘adult’ area and ‘kid’ areas separate which is nice! the kitchen is also really nice! it has nice cabinets and a flat top electric range. there is also an appliance garage which is fantastic cause i hate tones of clutter and crap on my counters that doesn’t have to be! anyways over all i’m really excited about our new place! the location is great too cause we are walking distance from the main pool/water slide in town as well as a huge park and a petting zoo … there is also a big empty lot across the street that is big enough to play a game of football in … so there is plenty of space for christian to run around and burn off some of the never ending preschool energy that he seems to always have. now i need to think about all of the things i will need to make to get the place looking nice and homey … i’m already throwing ideas around in my head for a welcome banner for my door with a valentine theme since we are moving in before valentines day. well thats it for now i gotta run and get some stuff done since the list is really long now that we are moving in less than a month! hopefully i’ll be better about putting up things i’m working on! oh and one more note … i officially named my new ‘old’ sewing machine. her name is Bertha … I feel this is very fitting for her because she is big and tough and strong but yet she is still a girl … and Bertha just seems like a strong name … anyways thats it for now … talk to you all soon!!! So I have the coolest ‘new’ toy! 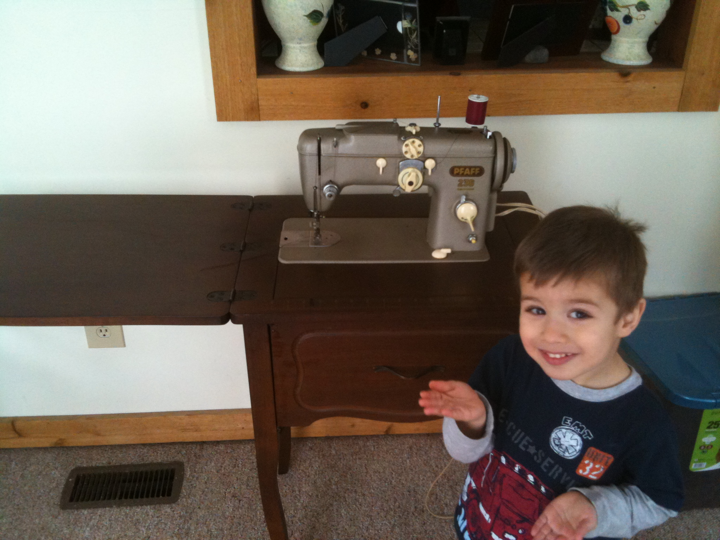 My aunt and uncle had a sewing machine that was my great grandmothers. My uncle originally had intentions of teaching himself to sew on it, but since has come to the conclusion that life is too busy and he wasn’t going to make the time for it. Fortunately for me they wanted to give family the opportunity to take it off their hands before they just gave it away to someone random. 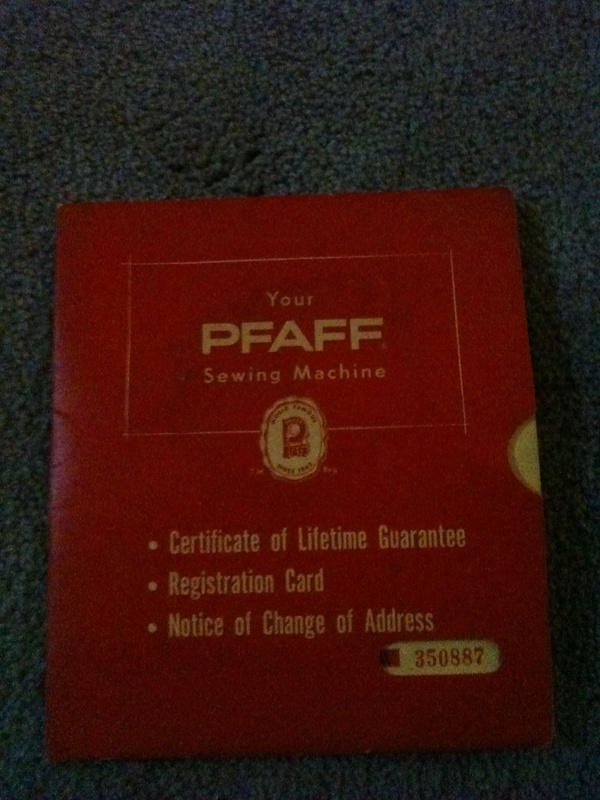 So I now have my great grandmother’s 52 year old Pfaff 23o Automatic! 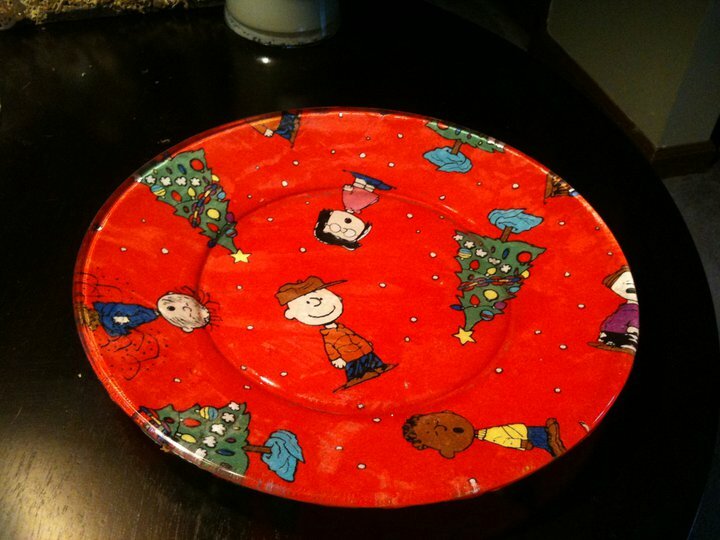 and its in a cabinet that is in perfect shape, like not a scratch on it! Christian insisted on being in the photo when I took it so you get to see him as well as my new machine. I have been having a really good time going through all of my great grandma’s stuff that came with it. She kept EVERYTHING! My mom told me today that this isn’t an isolated time she kept everything but it was with everything. She told me when Grandma passed away there were tons of twist ties and rubber bands that had accumulated over the years that they had to throw out! Now my grandma grew up during the depression so I am not surprised by this at all and frankly I have been quite enjoying what I’ve been finding. Since she kept everything she of course had the manual (which is good cause I wouldn’t have a clue how to use this without it!) 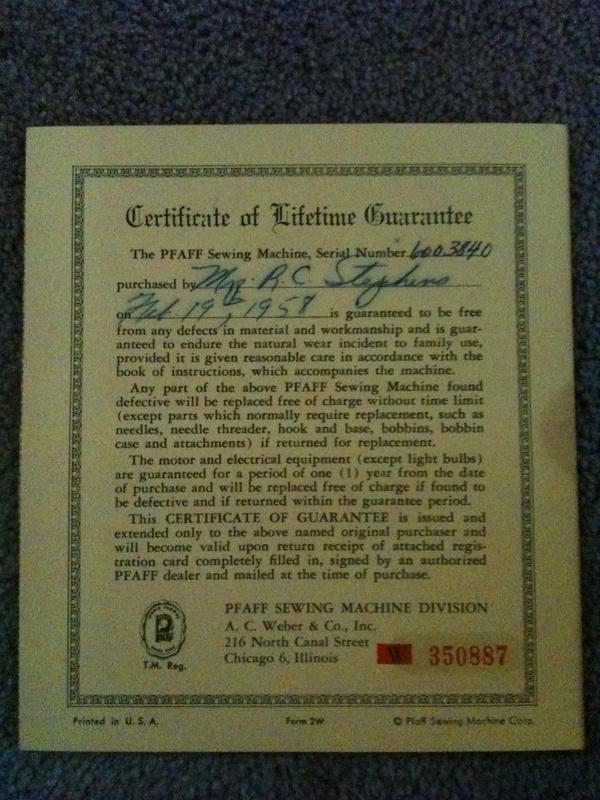 but she also kept the original “certificate of lifetime guarantee” that came with the machine. I do have to admit that it has been rough not being able to sew anything … I had no idea how much I used my machine till I can’t use it! I did get to try out my friend Tressa’s Janome machine and it was amazing! She doesn’t have a ton of fancy things on it or anything just the basic stitches, but it is quiet and smooth and feeds the fabric so well! it doesn’t shake or anything like my machine did when i stitched too quickly … I think I’m going to check the Janome’s out first when I get my check from ‘Santa’ to go shopping … If any of you out there have any tips or suggestions on a good machine PLEASE let me know! Well my hubby wants me to put the computer down and spend some time with him so I should go but you all should try to stay warm and dry … we have a winter storm headed our way so I will probably be inside for a bit 🙂 Have a good one! new machine i think … santa please?! so i have been having some troubles with my darn sewing machine the last few weeks … the tension has been crazy wacky no matter what setting i put it on … it has an auto setting but that is a huge joke … the darn thing cant decide if it wants to be to tight or too loose all in the same group of stitching … i’ve been trying everything from the first obvious changing the needle and then taking it off the auto tension setting and trying different settings … but it still isn’t consistent even if it is too loose or tight its not consistent at all within the setting … its obnoxious … i was managing not too bad because the majority of the sewing i was doing the stitches were hidden and i made sure that the stitches were still somewhat normal but then last night it started skipping stitches all over the place out of nowhere … not just a couple here and there like 6-8 at a time and then 6-8 normal stitches then skipping another 6-8 strait stitches … so i tried cleaning out the lent again and doing everything the book said except giving it oil cause i didn’t have any and still no dice … so i stopped before the night before i got too upset and knew that i would have to get some oil today and see if that helped. so after i got home from army stuff with my hubby i got some oil at the store (sewing machine oil of course) and went to it and got even more of the lent cleaned out and got yet a knew needle and started on a test quilt sandwich to see if that made any difference at all … and nope its getting worse yet … i thought maybe i just needed to sew a little to get the oil worked in but even after some sewing it still was being defiant … so i may take it in to the shop, but i’m going to call first to see what they think it is and how much it would cost … apparently just the yearly tune up for my machine since it is a computerized machine is like $90 and i only paid 200 for it … so i really don’t want to spend as much as i did on the machine to get it up and running … i would rather just upgrade because i have LONG outgrown this machine … and even though i have only had it for a year i have put a lot of miles on it! i would say i on average spend 40+ hours easy in my sewing room so it has got lots of use … i’m not sure what i’m going to do with myself till i get it either fixed or get a new one … maybe i’ll finish the hand quilting on the one quilt thats been on my WIP list for over 8 months …. 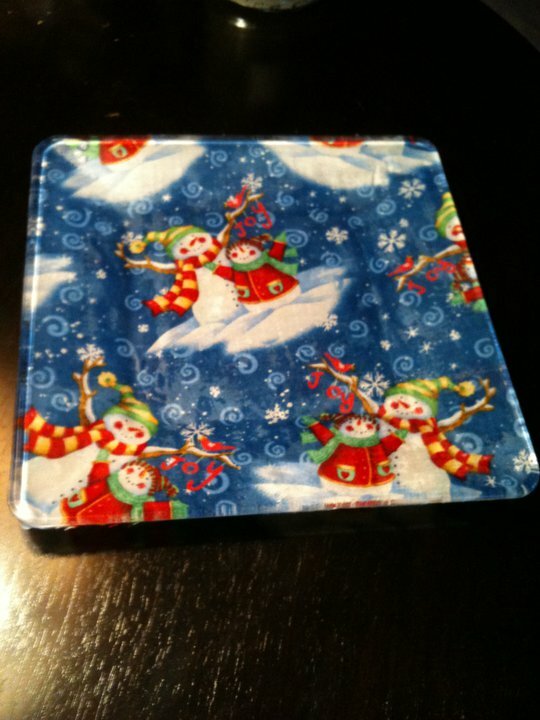 hmmm thats an idea … i dunno …. i am honestly just sad that my machine is not cooperating because i have so many things that i want to/need to work on for Christmas … we’ll just have to see what happens … maybe my people will get pictures of what i’m going to make them when i get my machine for christmas instead of the actual finished gift … we’ll see … oh well i should probably start some real research on whats out there and figure out what i have to have and what i want on a machine so this is all for tonight … more updates to come soon i hope! So its been a busy few days for the Garcia family. We have been spending our Thanksgiving weekend in Kansas City KS (well technically Overland Park but who outside of locals would know where that is?) with my mom’s family. The drive down was long but fortunately mostly uneventful. We did have a one challenge but it was minor … the driver’s side window in our van has an attitude and will occasionally not want to roll up after you roll it down. Its power so we can’t just crank it up like you had to back in the day. So I hadn’t driven our van in a while and when we stopped for dinner and went through the drive through (like usual … ugh ) I of course rolled down the window and wouldn’t ya know it decided to be a pain and not roll back up. now this wouldn’t have been a huge deal had it been 70 degrees out but it was more like 35 and rainy … real fun for a window down on the interstate. so my husband and I proceeded to help the window go up by pulling the physical window up for about 30 minutes and that at least got it up to the point where it was only open about 5 inches … I wanted to just get going at that point so it was tolerable with the heat on so we left and dealt with lots of road noise for the next couple hours till we stopped again and repeated the process and finally got it all the way up. It was pretty annoying at the time (when I’m on a long drive I don’t like stopping much cause I just want to get there) but looking back at it there could have been much worse things that could have happened in the driving conditions we were in on one of the busiest travel days of the year! Well we are doing pictures this morning with Christian and my nieces and I need to go get Christian ready so I gotta run. Hope you all have a great day!